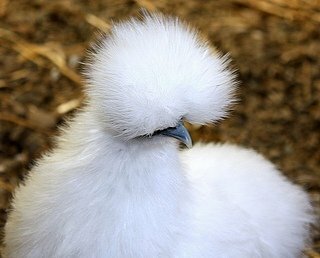 Silkie Chickens are very unique looking and make excellent pets because they are so docile, friendly, and adapt well to confinement. Size: Male: 36 oz. / Female: 32 oz. Comb, Wattles & Earlobes: Walnut comb and wattles are small to medium; earlobes are very small. Comb and wattles are deep mulberry to black; earlobes are turquoise blue. Color: Beak is leaden blue; eyes are black; shanks and toes are bluish black. Gray: Gray plumage over entire body, ranging from dark to light. Special Qualities: A very unique looking breed. These birds make great pets because of their temperament and they are also very broody mothers. Silkies are thought to have originated in China, although India and Java may argue that they came from there. Silkies are one of the few truly one of the kind breeds. They have a gene that results in bluish black skin, bones, and meat. These attributes attributed greatly to the Silkie breed becoming an important part in early Chinese folk medicine. These birds adapt well to confinement and are very docile and friendly. They do not however do well outdoors in extreme climates, be it hot or cold. Their special feathers do not hold in heat, keep heat out, or shed water. They lay small tinted eggs, but the mothers are most known for being very good brooders. 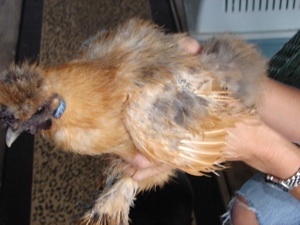 The Silkie moms are often used for foster moms for other chickens eggs. They will even continue to mother the birds once they come out, no matter what they look like. Silkie Chickens were first recognized by the APA in 1874.